3. Forget about the quality. It’s quantity we want here. Not every single word has to be Booker Award Quality. No one ever has to see this novel. Chris Baty refers to this Nano written draft as “draft zero” ie, the pre first draft….remember that! 4. Have a comfortable environment. Here in the UK, I won’t care where I write as long as its warm lol. My preferred place is my desk, but, I’ll also be attending write ins and going on a retreat. So as long as I’m warm and comfy I’ll be fine 🙂 If you like to write to music, make sure you have your favourite tracks on hand, and if you like silence (like I do) plan your writing sessions around times you know you’ll be on your own. 6. Try to eat healthily. Yeah, ummmmm, this is my advice, but I don’t normally take it lol. I tend to snack a lot during Nano. The family live on take out, and I hate to imagine how much chocolate and Pepsi I consume during November. Sooooo, my advice is, have whatever you need/want to keep you going, but, do yourself a favour, have at least 1 piece of fruit a day yeah? 8. Tell the family! Or room mate. Basically, whoever you live with. In my house they know that 1. They probably won’t get words of more than 1syllable out of me during November, 2. They will run out of clean underwear unless someone is assigned to the laundry and 3. That there won’t be much cooking going on (not that there normally is anyway I hear my daughter cry!). So best to warn your nearest and dearest I think. 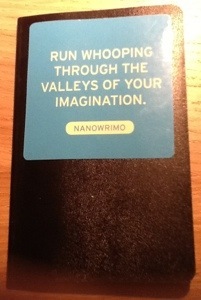 This entry was tagged Nanowrimo, National Novel Writing Month, NetBook, Word count, Writer, Writing, Writing Tips. Bookmark the permalink. Great advice Vikki. #6 is difficult for me. I tend to drink to much coffee during the day and wine and sour skittles at night during these challenges, but I will try. Great list. Number 4 and 5 ..and 6 are important! I eat terribly during November and then spend half of December trying to bring myself down from the caffeine that has infused with the red blood cells. Unfortunately, I won’t do NaNo this November and I’m really bummed. On a good note, I “won” both of the Camp NaNo sessions so I’ll be spending November editing. I’m determined to have completed, edited ready to see the light novels (yes, novels – plural) by the end of the month. 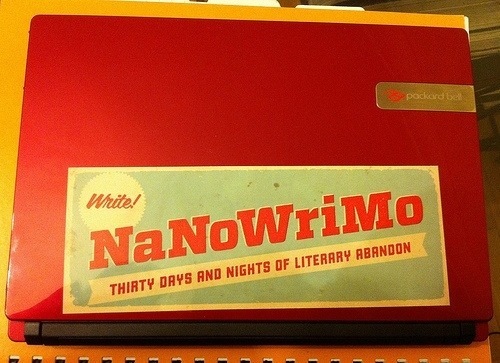 I will be around for cheerleading purposes for all those adventurous souls partaking in the journey that is NaNoWriMo. Your list hits all the important points. Good luck and will be tracking your progress!! Understand though. I don’t do Camp, I couldn’t do that AND November. Write with a buddy. That’s why I kept at it last year because I knew we were racing each other to the end. I’ve put more thought to serious plotting this year. I want to know where I’m going so actually end up there. I was a writing fiend last year because I hit 50K on the 16th because the story poured out. Odds are I won’t be able to keep pace like that this time. I was like that the first year….hit 50,000 words on the 11th!!!!! Couldn’t do it again the second year, but at least I had an ending to the 2011 novel lol. I still can’t figure out if in a planner or a pantster lol. That all sounds like excellent advice, Vikki. Great points all of these! One thing that I still have to do is make my playlists. I adore writing to music, so I make one for each day in November. Each is about two hours long which is enough time to get my words for the day. Good luck to you too honey! Though still not doing it…lol…I thought this was a very encouraging post. I especially like the part about your still a winner if you do more writing than you usually do. I didn’t complete the summer camp one, but it was still inspiring and I managed to write more of a fiction book than I’ve ever written. Who knows, maybe one day I’ll dig it back out and work on it some more. Yay! All of those are great tips. I will keep these in mind in November. I have some thoughts on number 2. A well known author of numerous novels gave some advice which was to ignore the word count, and instead think about the segments / chapters. A typical novel will have chapters roughly the same length give or take (say 2,400 words or whatever it is). That is just how readers like to take it, so loosely it is like a word count. But the focus is on the part you are doing, giving it a start, end and flow. Again the quality can be improved with rewrites, and it does depend on having a spine for your story even if that comes partially from what you do. But focussing that way gives the story more focus than the word count. What I did the first year was basically a chapter a day, but I was doing something like 4,000 words a day then lol. That is brilliant Peter! My hubby is exactly the same. Thanks for the pingback, Vikki! Best advice for nano– don’t panic! 🙂 I have to remind myself of that all the time when writing – and not just in November. 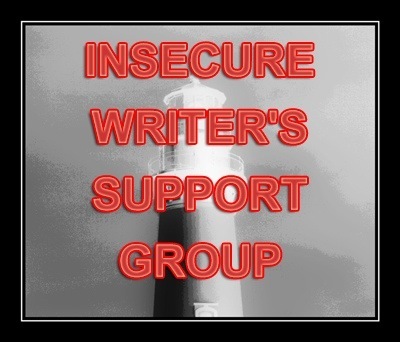 Hope to see you around the NaNo forums. Ha ha ha, yes, that’s a good one! Although, I still will lol. Yes, you too! Good luck! stuff. Understand it can be a great source of support, but I’m such a forum addict, I’m afraid to enter least I never find my way back out. So I hereby throw out a general appeal to anyone who sees me hanging around forums (fora? ): please tell me to get back to work! 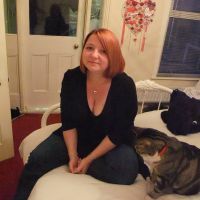 I don’t tend to use the main forums, just my local group (Kent) which is much easier to limit my time on. Pingback: How am i able to watch twilight Eclipse without doing them surveys? There is nothing so frustrating as having to rifle through tons of loose paper and index cards to find something in your notes, or realizing your reference material has mysteriously disappeared. I can get really disorganized during the first-draft stage, especially when experimenting with storyboard methods and outlines. There was a time when I had chapter-by-chapter synopses taped to my wall (that reminds me, I need to buy paint). Disorganization=disruption. For this reason, I favor typing my notes, character descriptions, story arcs, etc. and saving them all in one place. While I won’t be participating this year, I am so inspired after reading your post! You make it sound fun, crazy, educational and inspiring. Thank you so much for sharing! Thoughts of the Day: Really, it’s just been novel fever around here. Not thinking terribly clearly on any front, and probably won’t until the draft is finished. I’ve been pondering that last scene a great deal, and that’s about it. I’m doing NaNo for the first time this year. Thanks for the tips. If I can help in any way, please shout! Great tips! I didn’t know about the regions/Write Ins, I’ll check ’em out! Great tips. I have entered for the 1st time this year. Motivation is a lways a problem with me and I am easily distracted. See you in the forums! At the beginning of my transition from working on Broadway to writing full-time, I did Nano four consecutive years in a row. Hit 50K and past the whole time, doing what you suggest above. My daily goal was 2500 words/day, because I knew I had to hit 50K by Thanksgiving, which is a big deal in our family. Anything beyond that was gravy. My second year Nano had to be torn about and restructured for nearly 5 years, but it’s published and doing well, and I intend to revisit the others as soon as my contract schedule allows. I think the nano devil is against me. A deer flew at my car and damaged it badly on nano day 1. It’s in the body shop. Company on nano day 3, 4, 5. A lady ran her car into the rental car on day 8. Had to get that fixed. Sheesh. But, (Holly raising her fist) by the grave of God, I will not be defeated. Losing is not an option!! I love the “Draft 0” argument. So many people who criticize NaNo do so because they don’t understand why quantity is important: that NaNo is all about committing to getting the darn thing written, and that any GOOD writer will spend time editing after the fact, anyway. But as far as quality, I definitely would consider my NaNo draft to be the zeroth draft, the one I wrote solely for the purpose of getting the basic plot down. You’re welcome, and thanks for stopping by here!